LabourList readers are overwhelmingly in favour of extending Article 50 – even if that involves holding European elections, our latest survey has found. Jeremy Corbyn, Keir Starmer and other top Labour figures have warned that a Brexit delay beyond May or June would incur “legal complications”, and the Labour leader has made clear that his preference is to extend Article 50 only by three months. But others have said a longer delay would be necessary for the UK to hold another EU referendum, such as a ‘confirmatory ballot’ on Theresa May’s Brexit deal, if only because it would take time to legislate for the vote. 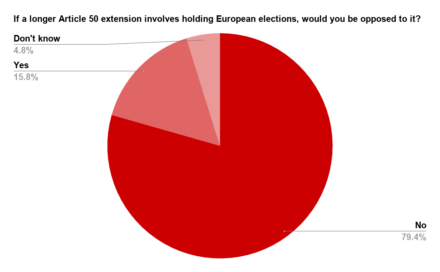 Almost 80% of 4,496 respondents said they would not be opposed to a longer extension, rather than what Theresa May has termed a “short, technical extension”, even if European elections had to take place. Only around 16% expressed opposition to such an outcome. A majority of LabourList readers who took the latest survey also said the 24 Labour MPs who rebelled to vote for another referendum in last week’s Brexit votes were not right to do so. 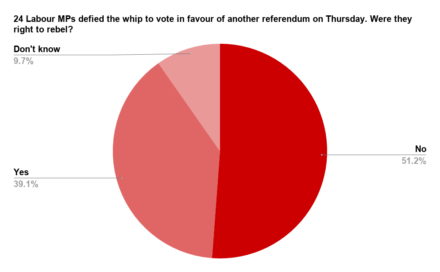 Although backing another referendum is party policy, Labour whipped MPs to abstain on an amendment proposed by The Independent Group’s Dr Sarah Wollaston. The change, which would have made time to legislate for a public vote, fell by a huge majority as only 85 MPs voted for it. Over 50% of readers told LabourList that they believed the pro-PV MPs were wrong to rebel in this case, while nearly 40% said they were right to defy the whip to vote for the amendment. This difference of opinion reflects that seen in pro-PV groups last week: People’s Vote and Another Europe is Possible urged MPs to abstain, while Remain Labour wanted Labour MPs to rebel. Asked to assess the most important issues facing Britain today, LabourList readers named ‘austerity’ as the most pressing one. Ranking issues from 1 to 10, where 1 was most important and 10 was least, readers placed Tory cuts just above ‘Brexit’, ‘health’ and ‘housing’. ‘Defence/security’ and ‘immigration’ were considered to be the least important issues. Keir Starmer, John McDonnell and Emily Thornberry came out on top in the shadow cabinet question. 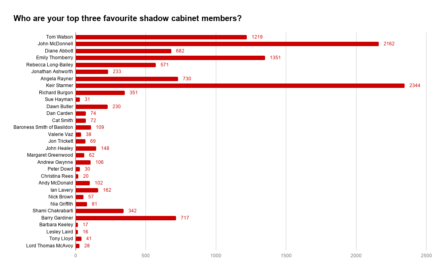 Excluding Corbyn, survey respondents were asked to name their favourite frontbenchers – and chose the same three as they did in January. 1. 24 Labour MPs defied the whip to vote in favour of another referendum on Thursday. Were they right to rebel? 2. If a longer Article 50 extension involves holding European elections, would you be opposed to it? 3. Which are the most important issues facing Britain today? Please rank them from most (1.) to least important (10.). 4. Who are your top three favourite shadow cabinet members? The survey was open from 10.15am on Friday 15th March until 8pm on Sunday 17th March. Thank you to all 4,496 readers who took part.